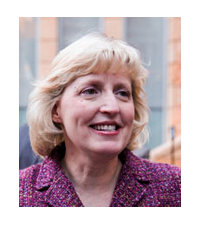 After 87 years, UMich's Ross School of Business will have its first female dean. Meet Alison Davis-Blake, current dean of the Carlson School of Management at the University of Minnesota. Her research interests include "the effects of outsourcing on organizations and employees, organizational promotion systems, and the determinants and consequences of contingent worker use and organizational wage structures." She was formerly an associate dean at UT's McCombs and assistant professor at Carnegie Mellon. You can find more of her credentials here, but for more personal details, you can check out this Financial Times interview (her heroes are Clarence Darrow, Honest Abe and Herb Kelleher; her favorite book, The Human Equation, by Jeffrey Pfeffer). Davis-Blake is expected "to increase the school's global presence, which has lagged behind other business schools, and recruit more executives to its executive MBA program," according to the WSJ. While other b-schools have been building campuses or establishing partnerships with foreign universities, Michigan has been stalled because its focus was aimed at completing a new 270,000 square-foot flagship building, says university provost Phil Hanlon, who chose Ms. Davis-Blake out of three finalists selected by a search committee. Known for her facility with EMBA recruiting at Carlson, Davis-Blake will be expected to do the same for Ross. And with her experience with global MBA programs, and her strong focus on collaboration and developing strong community ties, Davis-Blake's "global-local philosophy" seems, right now, to be a good addition to Ross's already well-known "action-based learning" approach.